CHASS anthropologist Scott Fitzpatrick was recently featured on NPR’s “Planet Money” about Yap and the nature of money. There’s a tiny island called Yap out in the Pacific Ocean. Economists love it because it helps answer this really basic question: What is money? There’s no gold or silver on Yap. But hundreds of years ago, explorers from Yap found limestone deposits on an island hundreds of miles away. And they carved this limestone into huge stone discs, which they brought back across the sea on their small bamboo boats. It’s unclear if these stones started as money. But at some point the people on Yap realized what most societies realize. They needed something that everyone agrees you can use to pay for stuff. A piece of stone money was really valuable; you wouldn’t use it for some everyday purchase. You’d use it for something big — a daughter’s dowry, say. “If somebody was in real dire straits, and something happened to their crop of food or they were running low on provisions and they had some stone money, they might trade,” says Scott Fitzpatrick, an anthropologist at North Carolina State University who is an expert on Yap. So imagine there’s this great big stone disc sitting in a village. One person gives it to another person. But the stone doesn’t move. It’s just that everybody in the village knows the stone now has a new owner. In fact, the stone doesn’t even need to be on the island to count as money. 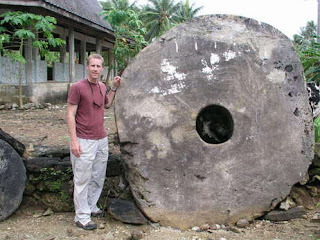 One time, according to the island’s oral tradition, a work crew was bringing was bringing a giant stone coin back to yap on a boat. And just before they got back to the island, they hit a big storm. The stone wound up on the bottom of the ocean. “So somebody today owns this piece of stone money, even though nobody’s seen it for over 100 years or more,” Fitzgerald says. This system, in the end, feels really familiar. If you go online to pay your electric bill, what’s really changing in the world? Some digits in your bank account get shifted around, along with some digits in the power company’s bank account.